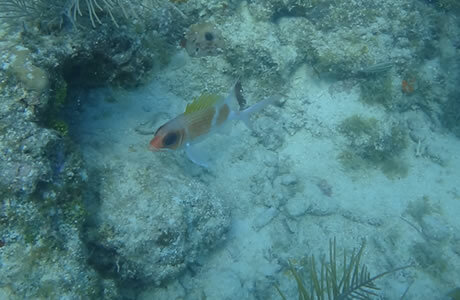 Sand Key, together with Eastern Dry Rocks and Rock Key, form a Sanctuary Preservation Area (SPA) that is considered a world-class snorkeling and diving area. Since the depth of the water is on the whole shallow to medium, this site is great for beginners and advanced divers. There are some ledges that drop 45-70 feet in depth, making interesting opportunities for deeper diving. Sand Key is one mile to the west of Rock Key. As its name implies, much of Sand Key is sandy, and the beautiful white beach is a tranquil place to relax. The area is marked clearly by a 110-foot light tower. Twenty-four mooring buoys are available on site for docking boats since anchoring is forbidden in an effort to protect the wildlife. Sand Key is noteworthy for the massive changes it undergoes in response to weather, so no two dive trips to the site are the same. You may climb the light tower to get an outstanding view of Key West. The sand is comprised of small shells and crushed coral, while the waters surrounding the island are home to living coral formations, large and small fish, and loggerhead turtles. Some of the larger fish species you'll meet include barracudas and groupers. Fire coral is common around Sand Key, so make sure you don't come in direct contact with it as you are exploring your surroundings. Since Sand Key is conveniently close to Rock Key and Eastern Dry Rocks, you'll also want to check out the ship remnants that are nearby; while the remains are too scattered to be easily identifiable at this point, you may find some nautical artifacts like brass fittings. Note however that since this is a Sanctuary Preservation Area, you are not allowed to remove anything from the area.